Pick something out of the World Vision Christmas Gift Catalog - you can immediately print out a card that you can give to your gift recipient, so not much time is required! We love that 86% of monies donated to WV go to help those in need - few charities are that efficient. 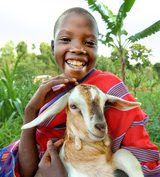 Goats have been a favorite gift over the years - but the chicks are so cute too! There are 7 gifts priced under $20 - so don't feel like you have to spend a ton to help someone in need. You also have the option to purchase a "share" of a larger item if that's of greater appeal to you. Another great option this Christmas is Soles 4 Souls. You can spend 5 minutes, $5 dollars and make a huge difference in the lives of 2 people - your $5 buys 2 pairs of shoes! soles4souls' mission is to get shoes to people who need shoes - can you imagine not having a pair of shoes and being forced to go barefoot? Over 300 million people around the world don’t have shoes and are forced to walk around unsafe and in potentially life-threatening conditions. Wow! Blows my mind! We all also have tons of local charities & angel tree projects going on around us if you'd prefer to keep your dollars closer to home...so if you still have shopping to do, take a minute and do some shopping that will make a difference...Merry Christmas!